Action scenes are hard to write. If you’re anything like me, and not very athletic, fantasy is where we dream about things we could never do in real life. My plots make my characters run great distances, hike up snowy mountains, gallop on war horses, and engage in hand-to-hand combat. Me? I’ve never done any of those things. I have a day job where I sit at a desk and do paperwork. It’s an adventure to walk to the car. When writing fantasy novels, I combine my imagination with first-hand accounts of explorers and athletes. But research can only take you so far. Unless you have years of fight training yourself, it’s not easy to create a believable action scene. Also, don’t impose on experts you may find at the SCA, the ren faire, or your local boxing gym. Pro fighters mean well but they shouldn’t choreograph your scenes for you. They are not writing your book. Ultimately, it is your story. If action is not clear in your mind, then it won’t be clear on the page no matter how thoroughly you discuss “what if…” with your source. Over the years, I have come up with a unique method for staging a fight scene. Drawing stick figures and football-play type diagrams did not give me enough information. Then, I was inspired by those old war movies where generals use model battleships on a tabletop. I decided to make a 3-D storyboard by using figurines as a stand-in stunt crew. My model figurines of choice? Barbie dolls. Don’t laugh. I have a big box full of Barbie and Ken dolls from my own childhood and from my daughters. If you don’t have a Barbie collection, then scrounge your local thrift shops and garage sales. The newer dolls have jointed limbs and can be posed in realistic ways. They are 11 to 12 inches tall, which scales to 2 inches per foot in the real world. 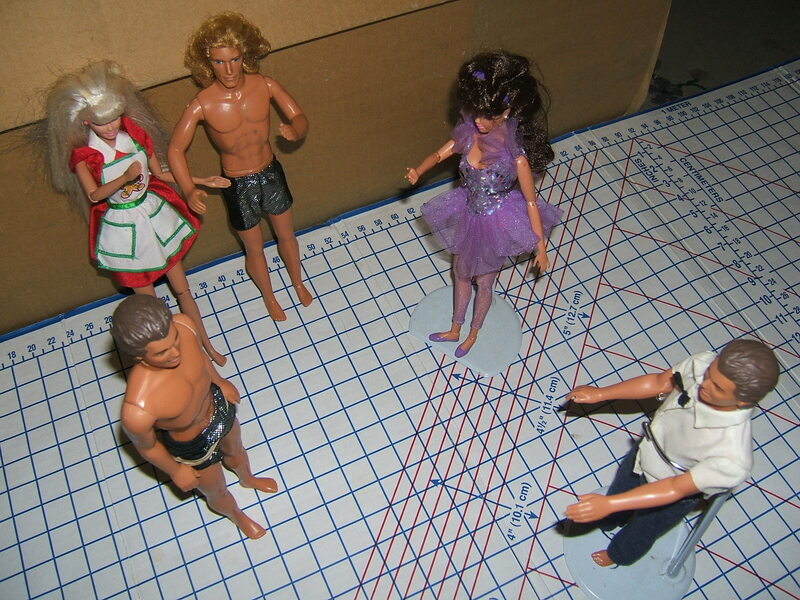 In a fight scene involving multiple characters, dolls help me keep track of all the moving parts during the days or weeks that it takes to churn out a first draft. It reminds me not to neglect people in the background. Like a stage or film director, you can study the positioning of figures from all angles. It reveals obvious problems in your choreography and suggests movements that would not occur to you simply by sitting at your keyboard. 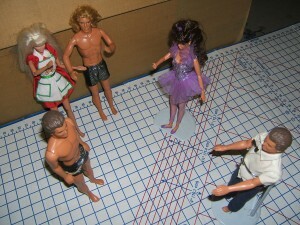 Mark out the dimensions of your scene with string or painter’s tape. Or, you could invest in a cardboard cutting board from your local fabric/craft store that has graph lines printed on it. At 2 inches per foot, a 60 foot span (such as the distance from a baseball pitcher’s mound to home base) converts to 120 inches and could be staged on a driveway, a patio, or an empty garage. How far can your hero throw that battle-axe? Keep track of distances between characters as they move about the scene. How close are two characters standing before one makes a lunge? An average 10×12-foot room would be represented in miniature with a 20×24-inch cardboard box. Where is the window, and is the villain blocking the hero’s escape? Does he have enough room to swing his sword or would he knock over a candle and start a fire? Use props like cardboard for walls, books for furniture, rolled up bath towels for landscaping, canned foods for rock and trees, stuffed animals for fantasy monsters, and so on. How many heroic fighters are needed to surround a troll? Popsicle sticks make good swords, and BBQ skewers can be used for spears. Masking tape can easily attach “weapons” to the dolls’ hands. A lamp or flashlight can simulate the sunshine—would it be glaring in your hero’s eyes as the villain attacks? 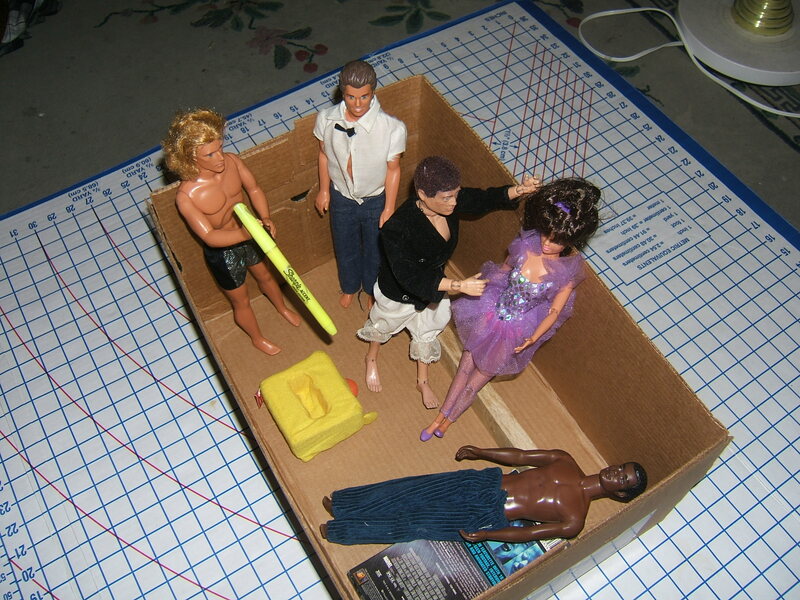 To make the dolls stand up, you could either invest in actual doll supplies or DIY something at home. My quickest, easy method is to wrap a sturdy rubber band tightly around the doll’s waist. Then, stick the handle of a stainless steel dinner fork in the rubber band with the prongs facing downward. The fork’s prongs should be level with the “ground” surface and be curving away from the doll’s heels. You can experiment with various sizes of utensils to see what works best. Use a digital camera to take snapshots and quickly create a storyboard of your scene for future reference. Fun and useful tips, Denise. Thanks! What an amazing technique! Loved your backdoor to publishing blog post on the Snarkology. Thank you, Nicci. By coincidence, we are going to have a paths to publishing post here tomorrow. A very interesting story from a successful independent author who writes Fantasy, SF and horror. He already quit his day job, so you know, a bit of a role model to me right now.